Let’s face it, in spite of all of the salads, chia, green juices and passed up cookies you take pride in working on all week long, when it comes to a bbq, you’re still thinking burgers, buns, coleslaw and potato chips (of course washed down with a beer!). Grilled foods can be the most healthful, satisfying and delicious things you eat all summer, so it’s time to re-visit your menu. Go grab your apron, chef’s hat and tongs and get ready to prepare some delicious grub! Stick to your healthy habits every chance you get and have a PLAN before you face temptations as a guest or turn on the heat as a host. One goal is to make at least half of your plate vegetables. Another is to drink still or sparkling water. One more goal is to decide what (if anything) you want to indulge in: a beer or wine? A bun on your burger? A piece of pie? Bring a crudités platter, fruit salad, and vinegar based bean salad or cabbage slaw as a host gift. It ensures you’ll have something healthful to eat, so you aren’t stuck with mayo laden salads and hot dogs! Eat a little something before you go. Gazpacho, shrimp cocktail, a salad or even a green juice will keep you arriving ravenous which can trigger even the most controlled eater! Keep your hands full. Fill one hand with spa water and put a napkin in the other. It’s hard to keep reaching for the chips if your hands are occupied. Survey the buffet and visualize your plate before you dig in! Plan to focus on the great company, being a stellar host or helpful guest and enjoying the day. Take the focus off of the food, and put it where the real priority is: on your friends and family! Make the most of your meats. For your entree, choose grass fed burgers or steak, wild shrimp, salmon, organic chicken and local sausages. Choose lean cuts and try not to char or burn any part of the meat, as HCA’s (heterocyclic amines) and Polycyclic aromatic hydrocarbons (PAHs) can form when the meat is cooked at too extreme temps or fat drips onto a flame. Keep in mind that eating too much meat will leave you tired and lethargic. Spend your money on quality, not quantity. Try meatless. There are great veggie entrée options for the grill these days, too: Hilary’s garden burgers, zucchini, pepper and onion kebabs and portabella mushrooms top my list. Veg it up. Make too many veggies, so you can enjoy them allllll week long! Zucchini, asparagus, corn, tomatoes and onions (slice them from root end to top, remove the skin and grill cut side down) are spectacular on the grill, but you can grill leafy greens like cabbage, collards and kale, or even split your romaine in half and toss it on. You’ll be amazed at the flavor that comes out of grilled leafys. 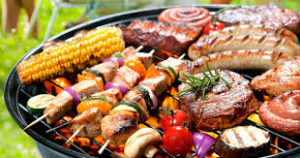 Simply grilled foods, without a lot of added sauces, marinades and dressings are an easy and healthy choice. Oil the grill and sprinkle some herbs on your meats and vegetables before they go on. You can add flavor afterwards by topping with avocado, salsa, kimchi, mustards, vinegars and pesto. Healthful marinades and rubs are everywhere. Seek out the ones that don’t have sugar, honey, ketchup or bbq sauce as those burn easily and add unwanted calories and sodium. You want vinegar, olive oil, citrus and herb based marinades that impart tons of flavor and health benefits too! Large cuts of meat and chicken may need several hours to 24 hours to impart the best flavor from marinades. Fish and vegetables need less marinade time, so plan accordingly.